I saw a guy wearing these just a day or two ago. It was the first time I'd actually seen a pair. The first thought that sprang to mind: "Planet of the Apes!" I know a guy who owns a pair, and I've looked on with envy for years, but after being reminded of their existence both by the NY Magazine article and Reddit I finally ordered a pair this week. I hope to be running around in them soon! I would grow deeply concerned about the effects of stankfoot and excess toejam biota personally. But that's just me. I've had a pair of Vivo Barefoot's for a year or so now and really like them, but these seem to be an improvement. Anyone have experience with both of these shoes? Thoughts? 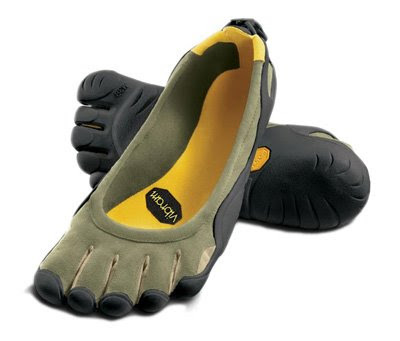 I have a pair of vibram five fingers and love them. Not only do they work great, they are amazing conversation starters. I've met people from Costa Rica to Amsterdamn solely because my shoes stood out so much. They can be a bit touchy to put on, but once you get use to them, you call in love. You just better be able to deal with being stared at. Oh those would be perfect for bouldering or some urban freestyle walking. Couldn't you picture the le Parkour guys wearing those? 1) They have to exactly fit your foot to be comfortable, and my pair didn't. I cut the little toe off of the right "shoe", and now they are much more comfortable, but still, I'm now "nine-toe" to my camping friends. 2) The vibram is good protection for hiking, but wasn't so good for water activities when I went canoeing. Grip became non-existant sometimes. 2. They have a non-slip sole, so I feel confident walking on linoleum after being out in the rain. 3. Our gym has a rock wall, and when you get to use your toes to climb up, it's really helpful. 4. Countless attractive people have stopped to talk to me about my crazy shoes. 5. Their stinkiness goes away after one wash- right in the machine! Go ahead and drop the money on them-it's a good investment. Those look ridiculously handy...and I've heard great things about the amazing effects of running barefoot, with the big toe separated from the rest. These would be perfect. I've been wearing them for about three years now. I got my first pair in the summer of 2007. I love them. They're the only shoes I wear outside of my rugby cleats. how have you been wearing them for about 3 years when you bought them in summer of 2007??? Cut him some slack. He did say the only other shoes he wears are rugby cleats (there's your hint). I have a feeling this might be one of the "wtf products of the 21th century" in the future. Wouldn't mind a pair, though. i had a friend who had these and he wore them when we went sightseeing in japan. It was full of sticky mud and wet rocks. he felt every bit of it in his shoes! How hideously uncomfortable. Think toe-socks. Plus added stuff. they look really, really ugly! i have a pair but i find pavement walking uncomfortable. great for grass, dirt etc though. and attention getting. 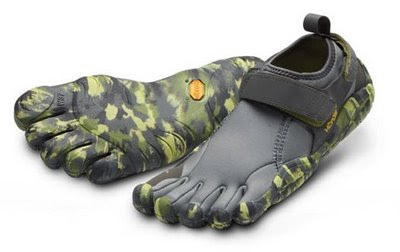 I have a pair, but they're the kind for my hands, I wear them when I have yard work to do. Really nice. 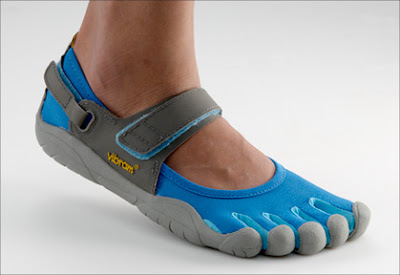 I don't want to see any shoes that remind me of people's toes. I hate feet and prefer to just ignore everything below the ankle. I have these, and I LOVE them. Make sure to measure your foot and follow the directions on vibram's site to get a great fit. e-cigar; are you me? Couldn't agree with you more. They look gross. Jack Johnson should be the celebrity endorsement deal. Lil JJ Casuals. My best friend used to wear these. Don't do it. they are the worst smelling pieces of footwear ever! I gave my friend a ride to school for his entire 5-fingers-wearing stint. after about a month, they smelled like sweet garbage regardless of how many times he washed them, and his feet. I was forced to tell him to get normal shoes, or walk to school. My advice: Don't do it. Wear flip-flops if you need freedom. I wouldn't wear that. But they are creative comcepts..
By appearance these seem to assume a certain toe length ratio. Might be tricky to fit. I saw these shoes and I must have a pair. I'm planning to get a couple different styles. They say on the site for the "KSO" and "Flow" that they could be used for "canyoneering". Would anyone actually recommend using these over hiking boots in the grand canyon? Thanks! I have a 3 pairs of Five Fingers (Classic, Sprint, KSO) and 2 pairs of Vivo Barefoot's (Root, Kariba). I find the Five Fingers more comfortable and wear them almost all the time (leisure, work, cycling etc), however I break out my Vivo Barefoot Kariba's for more formal occasions (job interviews etc). The sole on the Five Fingers is slightly thinner and I find they have much better grip on smooth surfaces due to the razor-siped soles. The only advantage, depending on your point of view, of the Vivo Barefoot's is that they attract slightly less attention. My longest toe is the one next to the big toe (yes I am a freak) so these might not fit so good. 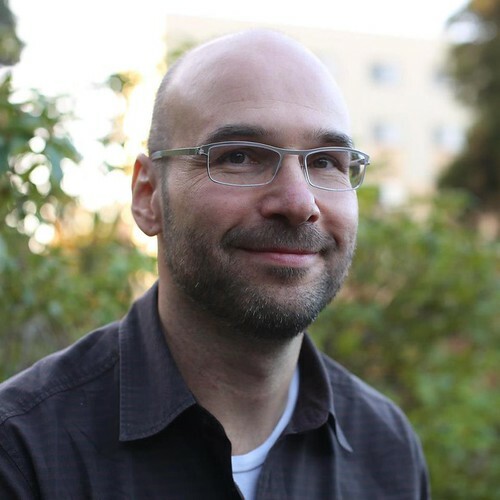 MattB, I have Morton's Toe, too (my podiatrist commented on how exceptionally long my second toe was even for standard Morton's Toe) and I own a pair of VFF Sprints that are incredibly comfortable. What you have to do is measure your foot length based on the length from heel to tip of the longest toe. They tell you how to do the sizing on Vibram's website. They're fugly shoes, I admit, but for working out, I don't care how my feet look; I care whether my arches cramp and my stability is good. And for all the people who are whinging about "not wanting to be reminded of toes" they strike me as being very much like the people who don't want to eat meat that has a bone in it because they don't want to be reminded they're actually carnivores.